UCL History is seeking to appoint an exceptional candidate to the post of ‘Lectureship in Medieval History’. We welcome applications from scholars doing research of the highest quality and able to teach successfully at both undergraduate and taught graduate levels, and in due course to attract doctoral students. You will be expected to teach modules of your own devising, that relate to your area of specialism; in addition you will contribute to a ‘team taught’ first year undergraduate core course. You will convene the module ‘Manuscripts and Documents’ (MA Medieval and Renaissance Studies) as well as developing an MA module which relates to your own field of research. We welcome applications from historians working on any aspect of medieval history (from c. 1100 on), in order to complement existing areas of strength within the department. The department seeks to build on its considerable strength in the field of medieval history, in terms of both range and depth. We are looking for demonstrable strength in palaeography and diplomatic, as well as strong working knowledge not just of medieval Latin but also of the key scholarly languages in the field, including French and German. This entry was posted in Jobs, Uncategorized and tagged history, lectureship, London, medieval, medieval history, Postgraduate, UCL, undergraduate, University College London on September 3, 2018 by costanzabeltrami. This entry was posted in Call for Papers and tagged codicology, manuscripts, Medieval art, medieval history on February 20, 2018 by medievalartresearch. The five senses occupied an ambiguous place in medieval religious life. For generations of theologians and pastoral writers, the senses were gateways for sin to enter body and soul. And yet, in the rarefied environment of liturgical performance, they became the means by which mortals could apprehend the Almighty. Imagery, music, incense, touch and even taste played a role in shaping medieval worshippers’ encounters with the sacred. The papers in this conference consider how the senses were employed and how they were a source of both religious solidarity and controversy. This entry was posted in Conference and tagged liturgy, Medieval art, medieval history, Theology on February 20, 2018 by medievalartresearch. The Department of History at Kalamazoo College invites applications for a tenure-track position as assistant professor of Medieval or Early Modern Mediterranean history, to begin in September 2018. As the sole member of the department responsible for this period, the successful candidate will be expected to offer introductory and upper-division undergraduate courses on the Mediterranean, Europe, and the Islamic world or Colonial Latin America. These classes should reflect their specific expertise and the broader geographic and conceptual scope of the field. We also seek applicants willing and able to help reimagine the department’s current curriculum. We are especially interested in transnational approaches to Mediterranean history focusing on issues such as (but not limited to) ethnicity, migration, majority/minority relations, gender, and the interaction between the different religious and imperial entities of the region. The successful applicant will also teach within the College’s Shared Passages Program of first-year and sophomore seminars and senior capstone courses. The teaching load is six courses per year on a quarter system (2/2/2), with additional duties including directing senior theses and academic advising. Ph.D. or evidence of imminent completion is required. Salary is competitive and commensurate with experience. The successful candidate will have demonstrated a high aptitude for and interest in undergraduate teaching, a commitment to the liberal arts, and a promise of scholarly excellence. Kalamazoo College is a highly selective nationally known liberal arts college offering an integrated undergraduate experience that weaves a traditional liberal arts curriculum into educational experiences in both domestic and international settings. The campus is located midway between Chicago and Detroit in Kalamazoo, Michigan, a metropolitan community of 225,000 that supports several college and university campuses along with numerous civic arts and cultural associations. Completed applications received by October 16, 2017 will receive full consideration, with later applications reviewed as needed until the position is filled. Upload cover letter, CV, detailed statement of teaching philosophy and goals, description of scholarly interests, statement on experience working with underrepresented students and engaging issues of diversity and inclusion in the curriculum and pedagogical approaches, and undergraduate and graduate transcripts (unofficial acceptable) in PDF format below. Please have three confidential letters of recommendation sent in PDF format to HistorySearch@kzoo.edu with a subject line in the format lastname_firstname. Please send all inquiries to Dr. Joseph J. Bangura, Chair of the Search Committee. This entry was posted in Jobs, Uncategorized and tagged early modern history, Job, kalamazoo college, medieval history, mediterranean, Tenure-track, USA on September 28, 2017 by costanzabeltrami. All are welcome to this free event at the Clagett Auditorium, Canterbury Cathedral Lodge. It will be held on Tuesday the 6th of June from 18.30-19.30. Professor Paul Binski, from the University of Cambridge, will be exploring Thomas Becket and the Medieval Cult of Personality. This entry was posted in Current Events, Lecture series, seminar, Upcoming Events and tagged Art and Architecture, Cults, cultural heritage, medieval, medieval history, religion, Thomas Becket on May 31, 2017 by AJeffs. Based in the Department of History at the University of Exeter, this studentship will contribute to the HERA-funded project ‘After Empire: Using and Not Using the Past in the Crisis of the Carolingian World, c. 900-c.1050’ (UNUP). This international project, based in Berlin, Vienna, Barcelona, St Andrews and Exeter, seeks to offer a transnational approach to the history of Europe in the tenth century. It takes as its starting point the observation that the relatively meagre administrative and legal structures of early medieval Europe meant that action in the present often drew authority and legitimacy from claims about the past. It explores how people in different regions of Europe reacted to the changing political landscape of the tenth century by looking at the ways they chose to use and not use their shared past. The PhD project will explore aspects of this question. The Exeter-led sub-theme is on ‘Using and Not Using the Past in Liturgical Sources’. It is anticipated that this particular research project will focus on how at least one religious community chose to use or not use their past through the study of the liturgical manuscripts they produced and owned in this period. The thesis will make a case study of individual manuscripts produced in a single community: both the manuscripts and community will be selected by the student in consultation with the supervisors. The core aims of the research project will be to investigate the extent to which a community, either in the heartland or on the periphery of the Carolingian Empire, chose to use or not use earlier works in the compilation of tenth-century liturgical books, and why they chose the particular source texts they did. Alternative research projects of equal relevance to the wider themes of the project will also be considered. The student will be supervised by Professor Sarah Hamilton, who is the project lead for UNUP at Exeter, with Dr Levi Roach. The PhD will commence in September 2016. UK/EU level tuition fees will be paid as part of the studentship, together with an annual maintenance grant of £14,296. Please note that this studentship is open to UK/EU students only. This entry was posted in Funding and scholarships and tagged manuscript studies, manuscripts, medieval history, medieval liturgy, phd, Studentship, University of Exeter on July 4, 2016 by maggiecrosland. In recent years there has been a revolution in the study of medieval warfare. 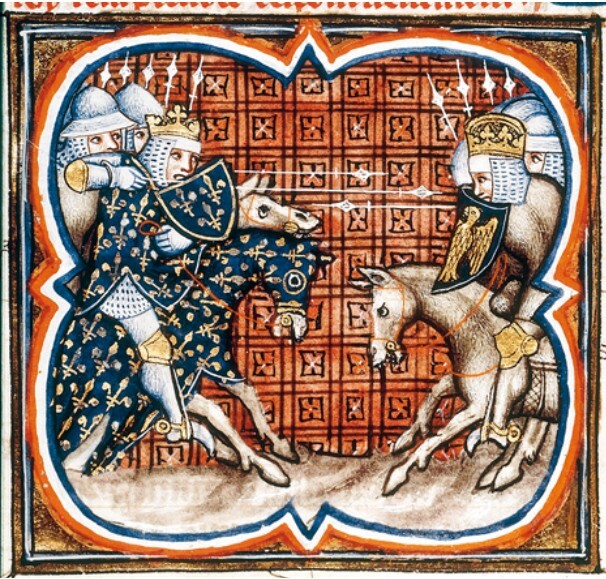 Traditional paradigms that emphasised pitched battles and the charge of heavily armed mounted knights have given way to a focus upon sieges and raids, as well as a more nuanced understanding of medieval generalship and of the place of war within medieval society. Yet much remains to be discovered about the place of battles in medieval warfare, and about their representation in contemporary historical and literary texts. The Face of Battle in Medieval History and Literature will be a one-day conference held by Swansea University’s Centre for Medieval and Early Modern Research (MEMO) on Friday 20 June 2014 to discuss the significance of the medieval battle. The year 2014 includes significant anniversaries for two epoch-making medieval encounters: the 800th anniversary of the French royal victory over Imperial, Flemish and English forces at Bouvines (27 July 1214), and the 700th anniversary of the Scottish victory over the English at Bannockburn (24 June 1314). Plenary papers will be given by Professor Matthew Strickland (Glasgow) concerning Bouvines and Dr Michael Brown (St Andrews) concerning Bannockburn. The Symposium will be held in honour of Professor John France, Emeritus Professor of Medieval History at Swansea University, to celebrate his many contributions to the history of warfare. Proposals for papers should be submitted to the Director of MEMO, Professor Daniel Power (d.j.power@swansea.ac.uk) by Friday 31 January 2014. MEMO is an interdisciplinary research centre, and the organisers welcome contributors who take literary or archaeological as well as historical approaches to the study of medieval warfare. This entry was posted in Call for Papers and tagged medieval history, medieval literature, medieval warfare, MEMO, Swansea University on January 8, 2014 by mariaalessiarossi.